Critical facilities need battery back-up and, until recently, the de facto standard was valve regulated lead acid (VRLA) batteries combined with uninterruptible power supplies (UPSs), But that has changed as lithium-ion batteries (LiB) have become more cost effective. It's been a rapid change, and the industry is still catching up with the benefits, according to Peter Panfil, vice president of global power at Vertiv. Only a few years ago, lithium was seen as a risky and expensive alternative to the proven VRLA option, says Panfil. "When I presented it, I got booed off the stage." It’s not surprising that the industry felt comfortable with lead acid. It’s a proven technology which dates all the way back to 1859. Even modern sealed VRLA units are around 70-years-old, first appearing in 1957. But VRLA has its drawbacks: it's bulky, heavy and high maintenance. The batteries need replacing every four to five years. It can also be unreliable: a 2013 study by the Ponemon Institute found that 55 percent of data center failures involved VRLA batteries. Later studies reduced that figure, but it's still a shock. 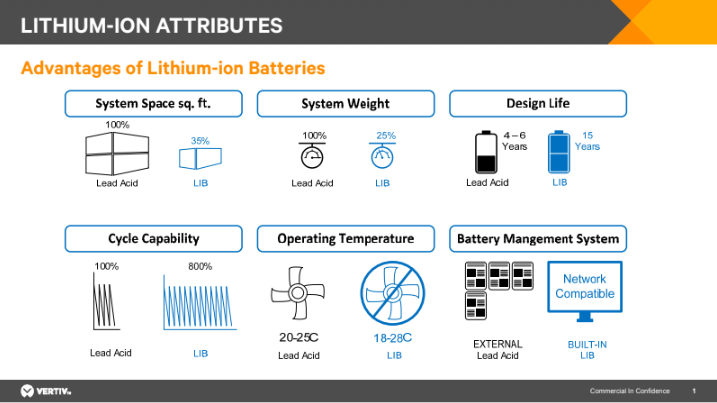 Lithium-ion batteries have advantages, but they came on the scene comparatively recently. They emerged in the 1970s, thanks to the work of physicist John Goodenough and chemist Stan Whittingham and were commercialized by portable device makers starting with Sony. 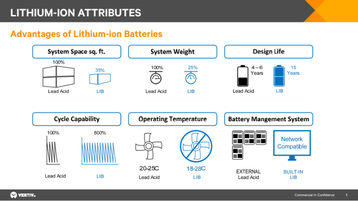 They have a lifecycle four times as long as VRLA, they are lighter and have a dramatically higher power density: VRLA can store around 40W/kg while lithium ion batteries achieve 200W/kg or greater. The big factor that makes LiB viable in data centers, however, is the recent dramatic change in cost. The technology started out with a big price disadvantage compared with VRLA, but the direction of travel was clear. Vertiv saw the potential and got involved early; that's when Panfil used to get pushback. In his first comparative chart, in 2014, lithium-ion batteries were four times the cost of valve regulated lead acid (VRLA) Three years ago, the normalized cost of lithium-ion was about three times as much as valve regulated lead acid (VRLA) batteries. Two years ago, they cost about twice as much. "A year and a half ago was 1.5 times; today, it's basically 1.2 times." But those are just the initial costs. The story changes when talking about total cost of ownership, for multi-tenant data centers (MTDCs) that need five minutes runtime from their UPS batteries. "If we normalize for that application, and a 15 year total cost of ownership, the lithium-ion battery is a big winner winner chicken dinner." The balance has flipped in favor of lithium: the TCO in data centers is now half the cost of running VRLA. No-one is booing anymore, says Panfil. "I used to say, once the total cost of ownership reverses, people will flip the switch. Now, people are saying 'Why would I spend twice as much?'" The progress hasn't happened by magic. Lithium-ion batteries have come down in price because of their commercialization in other industries, like electric vehicles. "In the critical space we are the surfer that catches the end of the wave, all those electric car makers went out there and figured out how to increase the density and safety and drive down cost." The TCO saving is just the beginning. More benefits are available. When customers start to take advantage of shorter runtimes and save cooling costs - because some LiB can thrive at higher temperatures. 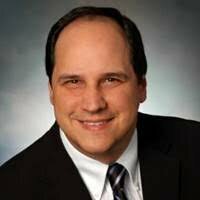 And there's more beyond that, says Panfil: "That's not even starting to look at what they can do when they apply smart power services through an orchestrated UPS, looking at demand management and energy arbitrage." There's also a value in the space savings, as lithium batteries are smaller, so customers can turn some battery-room space into white space. That's hard to monetize in existing buildings, but it's different in new designs: "One multi-tenant data center come in for a one day technology review, and they ended up redesigning their building. They cut their equipment room by more than half." In big data center hubs, that land cost is important: "In Northern Virginia right now, they're paying $2 million an acre, they're paying $50 a square foot for dirt. Every square foot makes a real difference." Another long term benefit will be a move to rationalize UPS provision. The industry is working to eliminate stranded capacity, and LiB helps rightsize the backup provision, says Panfil. "The industry has been going through a very quiet revolution for about the last five years, It started with the move from 2N to N+1: that is a dramatic elimination of stranded capacity." The change will be slow though, as the industry is conservative. "Right now, virtually everybody's spec has VRLA as the primary and LiB as the alternate. Eventually they'll go with LiB as the primary and VRLA as the alternate. And then eventually they'll have LiB as the source and they'll drop VRLA altogether." Lithium-ion still faces strenuous regulations, after some high profile problems with portable devices, even though data centers use products with a lower energy density which have a far more stable chemistry. Those backing rival technologies will still point to the fear and the regulations: "If their technology cannot compete on its merits, the only thing they can do is to strike fear into the users." There's even a place for lithium in the more specialist world of short runtime backup, which has mostly moved to thin plate pure lead: "Thin plate pure lead is a clear winner on first cost - but it still has a higher TCO now then then LiB." Of course, some might be skeptical of what is included in total cost of ownership calculations, but Panfil says they are based on first cost, replacement cost and ongoing maintenance costs. They also include the disposal of each kind of battery. 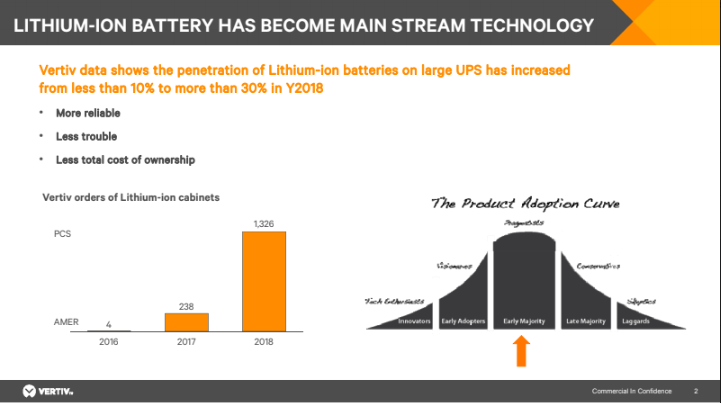 Vertiv invested in a lithium ion battery unit and started advocating the technology, when it became clear that the batteries were viable, says Panfil: "It's been an interesting journey. People say hey, you're not a lithium-ion battery company! Well, we are now."